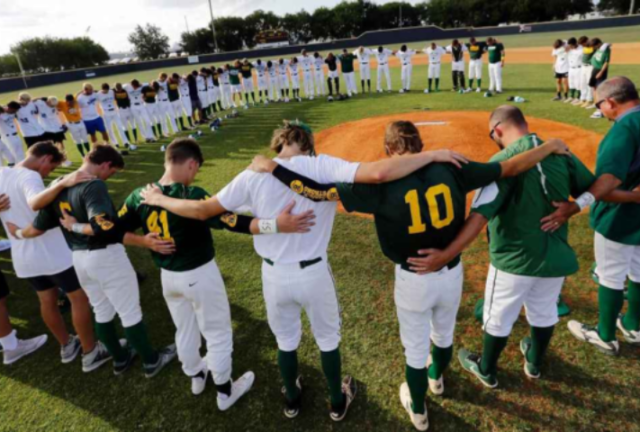 The Santa Fe High School baseball team held an emotional prayer circle before Saturday’s game in the aftermath of the May 18 shooting at the school. The Santa Fe Demons took the field at Deer Park High’s Jim Kethan Field for Saturday’s regional playoff against Kingwood Park High, losing in a 7-0 final. However, baseball wasn’t the only thing on the Demons’ minds, according to ESPN. A group of Santa Fe players also wore black-sleeved shirts with the number ten emblazoned on the arms memorializing the number killed on Friday. Members of the Kingwood High team even wore t-shirts with “Santa Fe Strong” on them during team warmups. Some players also wore their eye black in the shape of a cross with the jersey numbers of Trenton Beazley and Rome Shubert, their teammates who were not able to play due to injuries received during the shooting. Additionally, both teams came out of their opposing dugouts and formed a prayer circle on the field prior to the game. The teams also recognized a moment of silence for the victims. One player, just grateful to be there, was pitcher Rome Shubert who was shot in the back of the head during the Friday rampage. Shubert was lucky that the bullet passed through the back of his head missing all vital areas and just missing his spinal cord. “He was this close” to being paralyzed, said the player’s father, Mike Shubert. “I can’t really wrap my mind around it,” Rome said. “It’s pretty crazy. I really don’t know what to think about it. It’s very emotional. “I just went from Thursday night, pitching a game, to next day, shooter comes in our room and shoots it up, and I get hit in the head. Friends are getting hit. A couple of people in my class passed away. To come out here and have my team be as strong as they were … I’m really proud of them,” he added in shock. Santa Fe players and coaches were grateful for all the support they received on Saturday.